Following Up, Part 2: "A Whiter Shade of Pale"
This is one cool show. I say this not because I'm in it, but because the largely achromatic palette of this exhibition settles on your skin like a mist that's just a little bit lower in temperature than the air around you. 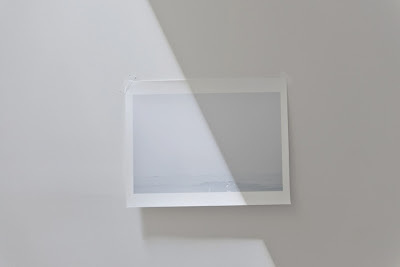 Kenise Barnes has selected six of her gallery artists for a summer show that conjures the poetics of pale: floaty, dreamy, luminous, that state just before you're fully awake, or the white light of transcendence. One of the things I love about the curation of this show is the range of ways Barnes has interpreted the theme. Mary Ellen Bartley's photographs depend on light to depict it, and shadows to heighten it by contrast. 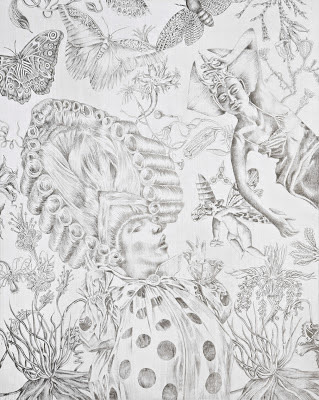 Lorraine Glessner's rococo fantasies--much richer and visually complex than a photograph of her work can convey--depend on fine linear elements and translucent layers of pattern on pattern. 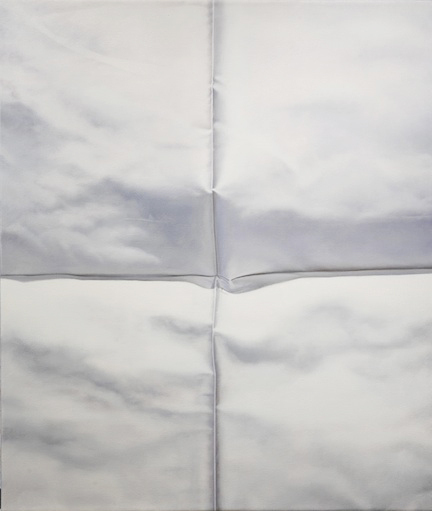 Charles Clary's physically spaced layers of translucent material start dark and end light, a topography that brings paleness into high relief. In my last post I talked about and linked to the various projects I was involved in. Now I'd like to show them to you more fully in a series of posts over the next couple of weeks, each with pictures and links. Because they're all group exhibitions, you'll get to see a lot of work by artists from around the country. 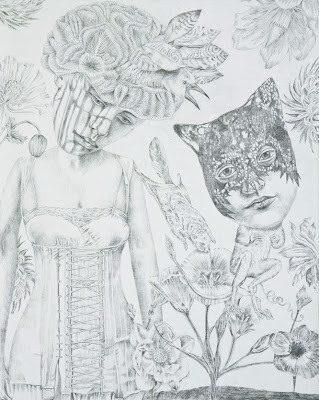 This show, at the Laconia Gallery in Boston, has been extended to July 5, all the better to be part of the First Fridays openings in the South End--so you have a bit more time, but just a bit more, to see it. 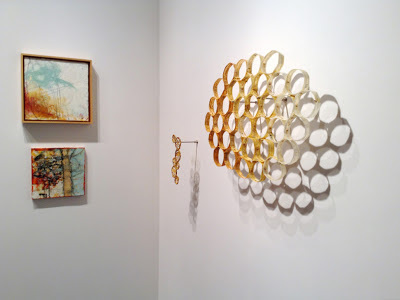 Curated by artist Linda Cordner and gallery director James Hull, the show gets its title from an online conversation several artists were having about encaustic, a composite of which went something like this: "We're painters, sculptors and printmakers. 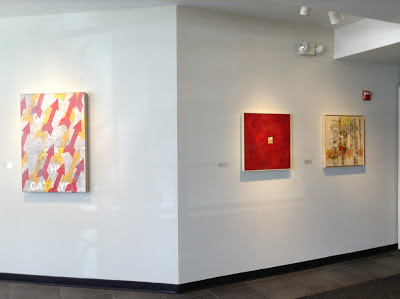 Our conversation is with contemporary abstraction, to issues relating to our specific disciplines. 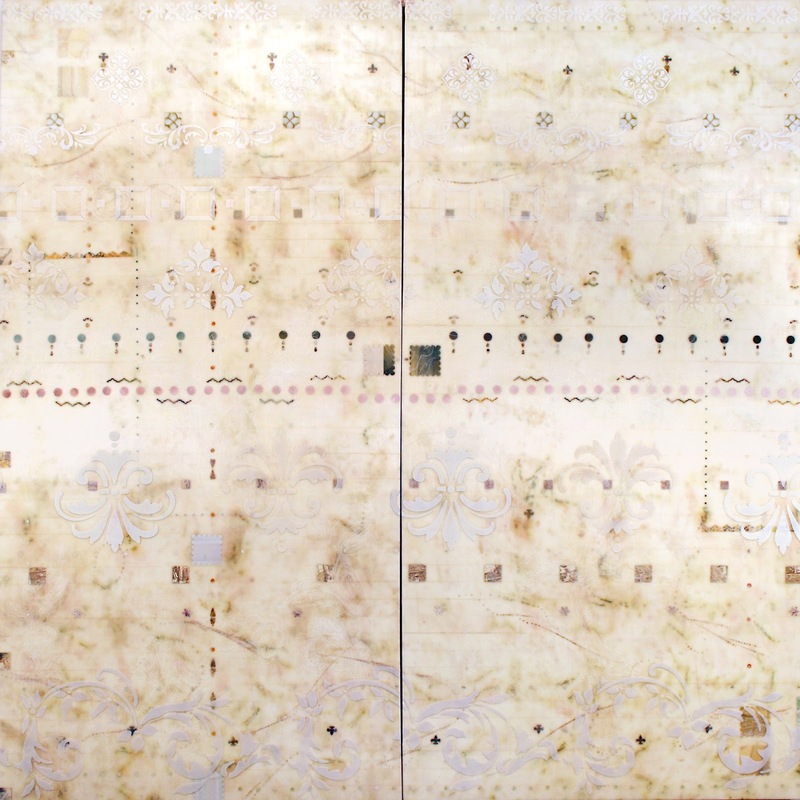 We work with encaustic (and love the medium), but the work is not about encaustic. If we were to show together, it would be because of our engagement with these issues. The elephant in the room is wax." The wall angles as we head into the gallery proper. This painting by Linda Cordner (Boston) has "a soft blow of dissolving vision . . . locating us in front of things faintly seen"
If you're wondering where I've been since I posted that picture of me drowning in a sea of work, this post will clear the waters. I've been running a conference, painting and delivering work for exhibition throughout the Northeast. I'll be posting sporadically until September, when I plan to pick up the pace and resume blogging more regularly. In the meantime, here's what I've been up to. 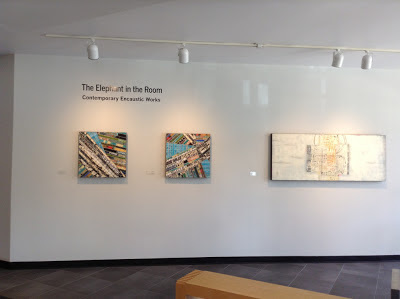 If you are on Cape Cod between now and June 23, stop in at the Cape Cod Museum of Art in Dennis to see Swept Away: Translucence, Transparence, Transcendence in Contemporary Encaustic. 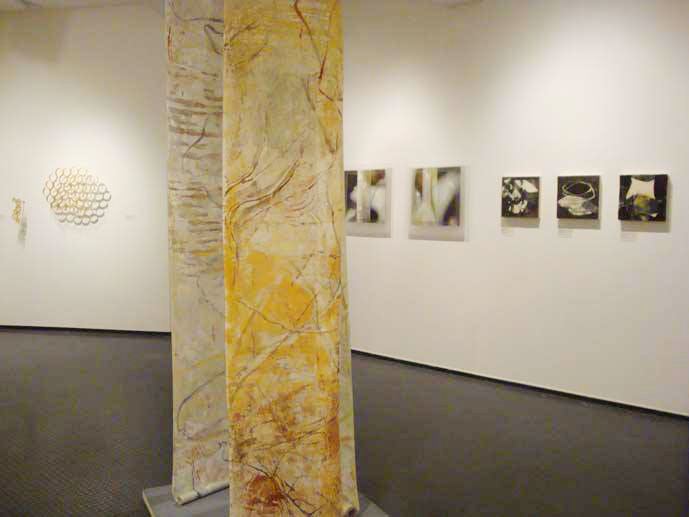 The CCMoA is the first regional museum to focus on painting, prints and sculpture in pigmented wax--and the first anywhere dedicated to a thematic exploration of the medium. Curated by Michael Giaquinto, the museum's curator of exhibitions, Swept Away features 52 works by 31 artists from around the country. This exhibition is timed to coincide with the Seventh International Encaustic Conference, which took place May 31-June 2 in Provincetown. 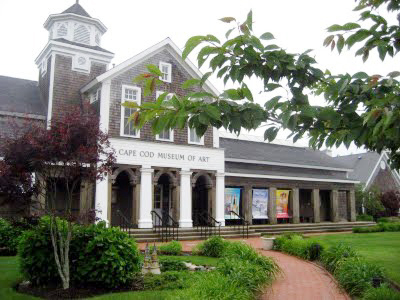 If you can't make it to the Cape (and may I say that it's truly beautiful this time of year, when the weather is warm but the vacationing hordes and their cars have not yet arrived), then take a look at the catalog. It's fully perusable online, but so gorgeous you just may want to buy it. There are essays by curator Giaquinto and me, with at least one full-color image by each artist. 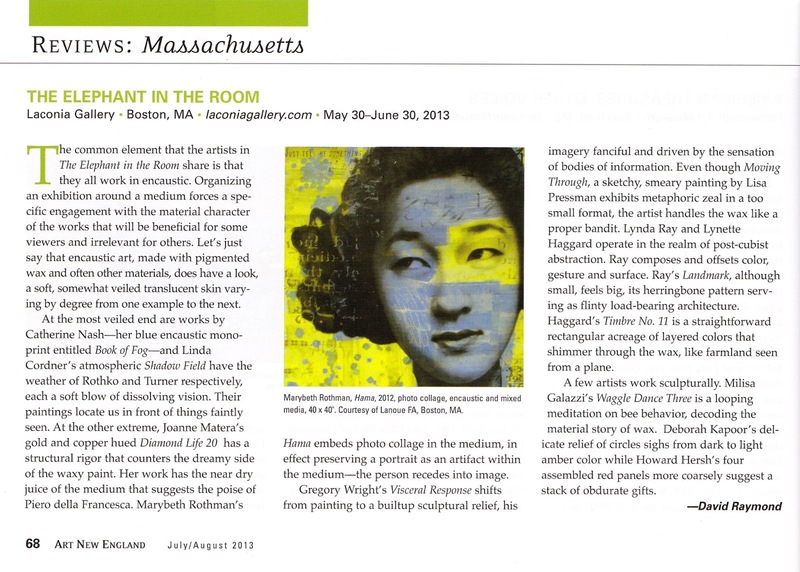 If you're in the Boston area, I invite you to visit the Laconia Gallery in Boston's gallery-filled South End. The Elephant in the Room, curated by Linda Cordner and James Hull, features the work of 17 contemporary artists from around the country with a selection of small to mid-size paintings, prints and works on paper. The elephant? Wax. "The artists chosen challenge the very definition of traditional encaustic painting by cutting, collaging, layering, using photographic imagery and ingeniously reinterpreting the medium itself," write Cordner and Hull in a handsome catalog that accompanies the exhibition. The exhibition is up through June 30. Now we're on the road to Manhattan. Let your first stop be in Larchmont at Kenise Barnes Fine Art. 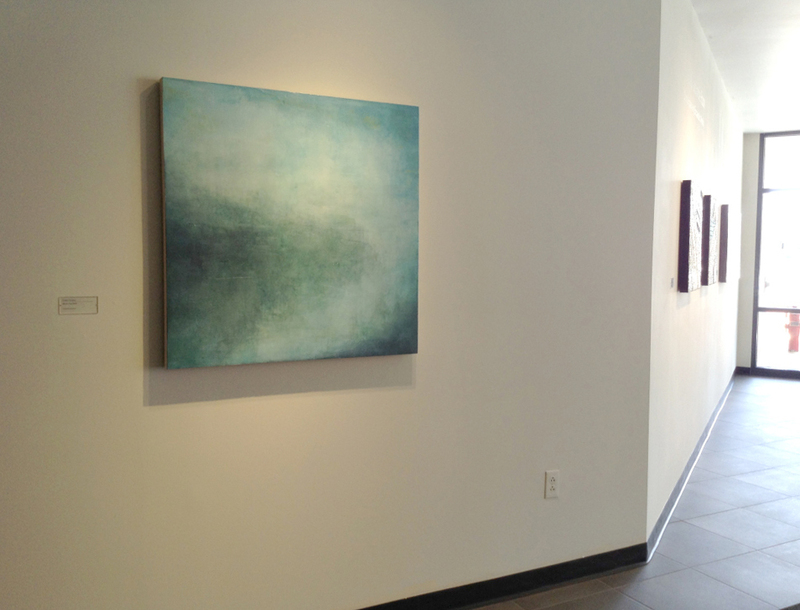 Recently expanded into a beautiful, larger space a few doors down from its original location on Palmer Avenue, the gallery is featuring A Whiter Shade of Pale. 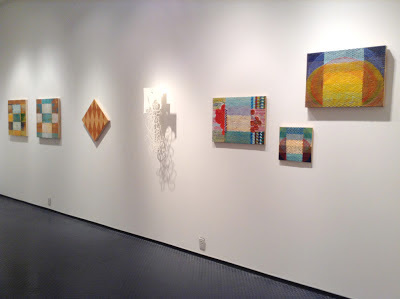 I'm one of six artists--along with Mary Ellen Bartley, Charles Clary, Lori Field, Lorraine Glessner and Lalani Nan--whose work here engages a quietly chromatic palette. I missed the opening but will get there this week. The gallery is around the corner from the Larchmont stop on Metro North, and the show is up through July 20. I'm going to post pictures later this week to tempt you to take the trip. 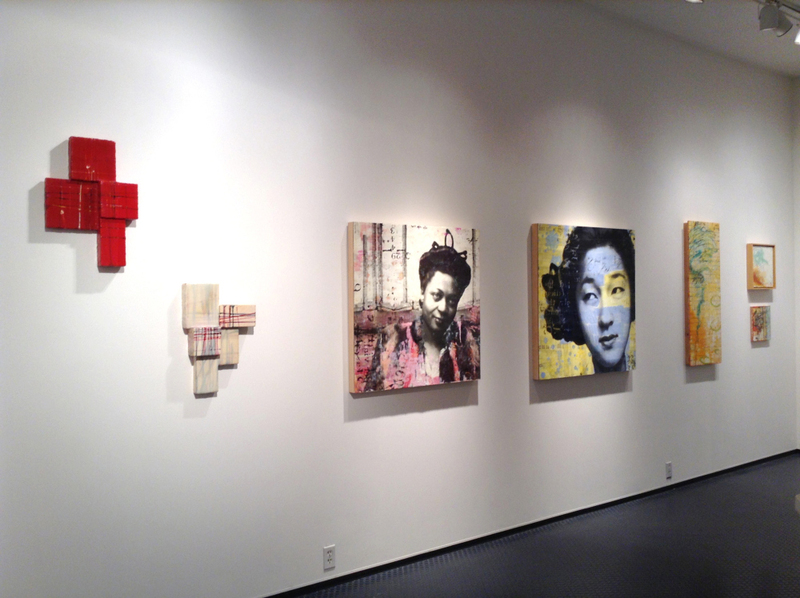 And finally, if you're in Manhattan, the Summer Show at DM Contemporary opens this Friday, June 14, from 6:00--8:00. Gallery owner/director Doris Mukabaa Marksohn has selected gallery artists and guests for a one-work-per-artist show. I get to hang with my peeps Steven Baris, Jackie Battenfield, Richard Bottwin, David Headley, Karen Schiff, Louise P. Sloane and others. It's a private viewing. If you wish to attend, email info@dmcontemporary to ask to be put on the guest list. See you there? The show is up through September 20.